Having started out, in 1834, as grocery and tea merchants in Stepney, East London, Harrods has become one of London’s premier West End shopping venues and one of the most famous stores in the world. Known for top quality merchandise and impeccable customer service, Harrods provides everything from an on-premises bank to an exotic pet shop. 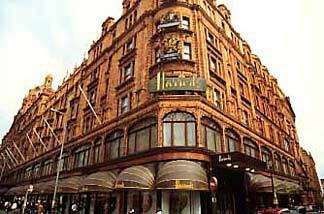 It is truly a “must-visit” on any London itinerary that includes shopping. The closest airport is London Heathrow airport which is around 12 to 13 miles from Harrods and takes around 30 minutes by car. They have excellent Airport Parking at Heathrow so leaving your car at the airport’s car park is an ideal solution to London’s parking problems. 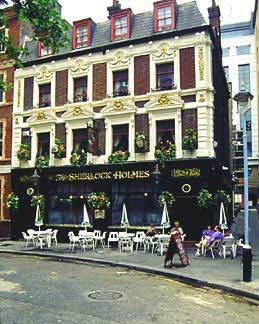 Set in a quiet corner at the end of Northumberland Street is the Sherlock Holmes Pub. Formerly the Northumberland Hotel, mentioned in Sir Arthur Conan Doyle’s tale, “The Hound of the Baskervilles” the pub’s gingerbready facade will reinforce every favorable stereotype there is about English pubs and the warm, inviting interior will make you feel right at home. A busy place at most times, there are two choices of venue for eating lunch and supper; downstairs at the pub and upstairs in the victorian-style restaurant. Either choice is good, but the restaurant offers an interesting variety of traditional specialties on its menu, particularly the roast beef and Yorkshire pudding. HOURS: Daily 11am – 11pm.